Stop Complaining About The Heat! So, now that the long winter is finally a thing of the past and summer is in full swing we are already hearing the complaints about the heat. As people go from there air conditioned homes to their air conditioned cars to their air conditioned offices they can’t seem to resist bemoaning the hot weather. While having dinner in an air conditioned restaurant after attending a movie at an air conditioned theater the topic turns to how miserable they are because of the heat. We live in an unprecedented time in human history. Never have so many lived in such comfort; We have indoor plumbing, central heating, cooling, home entertainment centers, and supermarkets with an endless supply of food at our fingertips, and medical care that is beyond what anyone could have imagined just a few years ago. Poor people in the United States today have more comfort than the wealthiest people did as little as a hundred years ago, yet we all seem to be complaining more than ever. It seems human beings react to positive change by looking for more reasons to be unhappy. A lot of this may be blamed on the amygdala, the part of our brain that plays the primary role in our processing of memory, decision making, and emotional response. The amygdala is programmed to seek out bad news. It does this because bad things can harm us, and in order to be able to defend ourselves from harm we must be alert to danger. With less danger around us the amygdala will become alert to more minor problems. It is one of the reasons we are so influenced by bad news. The more negative things we hear, the more likely we are to think things are much worse than they are. At a time when we should be counting our blessings we have become a nation of whining children. At a time when we should be counting our blessings we have become a nation of whining children. It really is tragic that with so much good around us we just can’t seem to stop and smell the roses. We have lost all sight of how tough things used to be. As July 4 approaches I think back to an earlier Independence Day. No, not the one in 1776, but one just less than a hundred years ago. 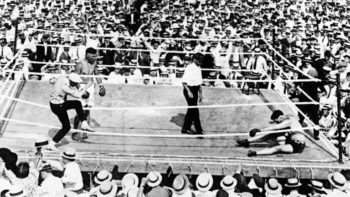 I have written about it before, the day Jack Dempsey won the Heavyweight Title from Jess Willard. While it was a brutal fight, I have often wondered what it was like have been sitting at ringside that day in Toledo, Ohio. While the fighters had to deal with the heat, they were in the ring for less than a half an hour, the spectators spent all afternoon there, and what an afternoon it was. When the crowd first arrived the temperature was in the nineties and rose to 110 degrees by the time the main event took place. The fight was outdoors and there was no shade. The sky was clear and the sun was blazing. On top of this, there was a shortage of beverages. The night before, a huge batch of lemonade had been made, but the fighter Battling Nelson mistook the tub containing the refreshing drink for a bathtub and bathed in it. Water was brought in, but not enough, and what there was was warm. Promoter Tex Rickard had the stadium built just for the fight, and it was put up fast. The lumber used had not had time to season so when people sat down on the boards the sap was leaking out sticking many of them to their seats and ruining there clothing. I guess it was one way to keep people from staying in their seats. You also have to remember that back then people did not have access to cool clothing. Most were wearing wool pants and jackets. The only protection they had from the sun were the straw hats they were wearing. There was no where to go for relief. Hotels and bars were not air conditioned. They might find a place with a fan or two, but that would mostly just circulate the hot air. It had to be miserable being there, but watching a film of the fight and the reaction to Dempsey winning the title, the heat did not dampen the enthusiasm of the crowd. It’s funny, but as tough as things were back then, I doubt many people complained. Daily life even for the best off was something we could not even imagine today. Life was hard and so were the people, but they dealt with it and moved forward. And, in moving forward they continually worked to make things better. Now that we have achieved so much it might be nice if we put things into perspective and stopped complaining for a while and instead, started counting our blessings. 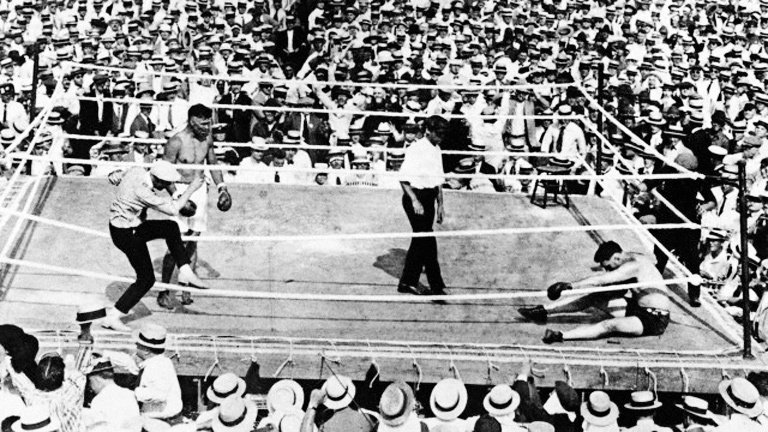 As hot and sticky a day it was on July 4, 1919, the people attending the Dempsey/Willard fight were actually there to have a good time, and they did. It would soon be back to work for them where things would be even harder. I’ve often thought that Jack Dempsey was possibly the toughest man that ever lived, but those fans at ringside were pretty hard characters too. Next time you complain about the heat while sitting with friends in an air conditioned room, just imagine yourself at ringside in Toledo in 1919. And also remember, those folks were there to have fun.